czy ktoś nadal gra I chce wziąć udział? Several Polish players regularly play on our server. Michał Aplik, Dariusz Ryszkiewicz, Kretes, wine is fine. Maybe it makes sense for you to talk to them? On August 26, the 2018 Open Cup finished. Sergei Chernobrovin aka Nnoitora won the gold medal, Alexander Shevtsov aka inthemiddle became the silver medalist, Alexander Parfenov aka Volunteer became the bronze medalist. The composition of the national team of Belarus was determined (the decision was made by the captain of the team). The following players will participate in the tournament: Andrey Andrush, Konstantin Zakharevich, Kirill Kozhemyakin, Artur Lisitsky and Eugene Parmon. Rules of the team tournament "Cup of Nations" published on our website. Applications for participation are accepted until October 12. The tournament will be held from 15 to 21 October. 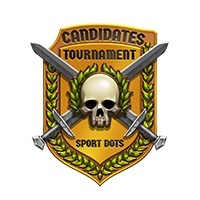 Venue of the tournament - the game application "Sport Dots". The rules of the game are Russians. The tournament is official, players are awarded a sports rating of the Sevastopol club. All members of the teams that took the first three places will receive metal medals. All participants of the Cup of Nations were determined. Medals will be played by national teams of Belarus, Russia and Ukraine. The composition of the first two teams, we have already reported. The composition of the Ukrainian team is as follows: Oleg Anokhin aka agent47 (team captain), Andrey Khodyrev aka BBC, Alexander Belevsky aka Bilya, Oksana Dymarchuk aka Ксюха198 and Nikolay Rybalkin aka fisherr (reserve player). The first round will begin on October 15 at 21 o'clock Moscow time. The tournament of national teams has come to the end. The Russian team won gold medals and the title of Olympic champion. Silver medals went to the team of Ukraine, bronze - to Belarus. The 2018 Regular Championship is over. Alexander Shevtsov aka inthemiddle won the gold medal and the title of the regular champion. Sergei Chernobrovin aka Nnoitora became the silver medalist, Andrey Khodyrev aka BBC became the bronze medalist. The 2018 Candidates Tournament has ended. The right to the title match with the absolute champion Sergei Chernobrovin aka Nnoitora was won by Igor Shlimak aka NIZBAGOYNIY MACTEP. The match will be held from January 7 to January 13, 2019 in our game application. From January 7 to January 13, the main event of the outgoing sports season, the Champion Match, will take place. Again, as in the previous year, we will have a dots classic - the opposition of Sergey Chernobrovin and Igor Shlimak. All the fans have probably lost count, how many times these principal rivals converged in the decisive fights. So far, all the attempts of an ambitious challenger have broken against the unshakable power of the favorite, but water destroys the stone, and no rock is immune from the fatal crack. When will this happen? Maybe never, maybe in a few years, and maybe in a few days. It is impossible to predict. The more interesting we will be watching the upcoming battle of the Titans. The sports season of 2018 ended on a high note. The Champion Match fully justified its elite status, giving us a week of uncompromising struggle, a sprinkle of great games and intrigue that lasted until the last seconds. There was everything: a crushing onslaught and fantastic resilience, balancing on the edge and wonderful rescue. Draw in the main part and felling on a tiebreaker. The challenger, who jumped higher than his head, and the champion, proved that he has no equal. Passion and pride. Honor and glory. Viva! February 3 starts the new sports season. The calendar of competitions has already been published on our website. On March 10, the 2019 Alena Serebrova Memorial finished. This year the tournament was held in blitz mode. Sergei Fedotov won the gold medal, Konstantin Zakharevich became the silver medalist, Oksana Dymarchuk became the bronze medalist.